In this issue learn with Sarah Ann Smith about on the edge techniques for binding quilts. Dorit Elisha explains how scraps and leftover bits can be used for a fabulous collage. 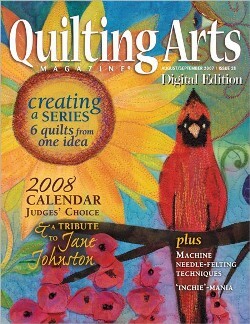 The story of Jane Johnston, whose quilt is on the cover of this issue, is moving and inspiring.